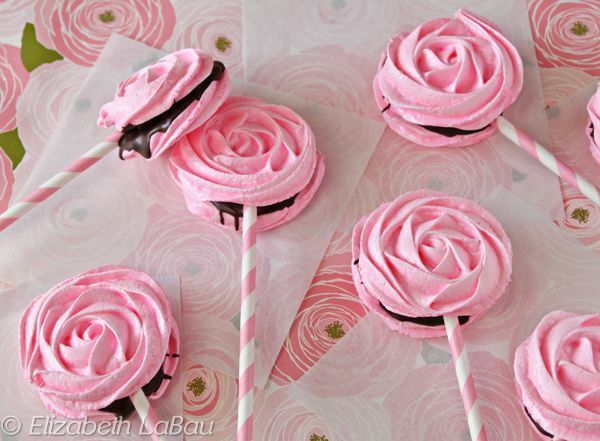 Meringue Rose Pops are beautiful meringue candies that look like roses! The subtly rose-scented meringues are sandwiched around rich dark chocolate, so each bite has a mix of crunchy and creamy textures, and floral and chocolatey flavors. Try giving your loved ones a bouquet of these instead of traditional roses! A note about ingredients: this recipe calls for rose water to give the meringues a light rose flavor. It can be found in the Middle Eastern aisle of many large grocery stores or specialty shops, or purchased online. If you can't find it you can substitute the flavoring extract of your choice, but start with 1/4-1/2 tsp, since some extracts can be very potent. Turn the mixer to medium-high speed and beat until the egg whites are foamy. Turn the mixer off, add the cream of tartar, and beat again on medium-high until the whites have turned an opaque white color and just hold soft peaks. At this point, start adding the sugar a few spoonfuls at a time with the mixer running. Adding the sugar slowly helps it incorporate and prevents the meringue from becoming grainy. Continue to beat the egg whites until they are very thick, glossy, and a shiny white color. When you stop the mixer and lift the whisk out of the whites, the whites should have a very stiff peak. This process will take about 5-10 minutes in a stand mixer. Add 1 tsp rose water and a drop or two of pink coloring. Gently stir together until the flavor and color is well-distributed. Taste the meringue, and add additional flavoring or color as necessary, until you have a nice rose flavor and soft pink color. Hold the piping bag at a 90-degree angle above the parchment paper. Using firm and even pressure, make a swirl, starting in the center and looping around the middle once or twice to form a rose shape. If you loop around once, you'll make a smaller rose, and if you loop around twice, you'll make a large rose about 2 1/2" in diameter. The pops in the picture are the larger size. Repeat until you've used all the meringue. This recipe makes about 16 large roses, enough for 8 large rose pops. Bake the meringues in the preheated oven for an hour and a half. After 90 minutes, turn the oven off, keep the door closed, and allow the meringues to sit until completely cool, about 1 hour. Once the meringues are crisp and room temperature, carefully remove them from the parchment paper. Place the dark chocolate in a microwave-safe bowl. Microwave it in 30-second increments until melted, stirring every 30 seconds to prevent overheating. Spread a spoonful of dark chocolate on the bottom of a meringue, and place a lollipop stick or paper straw in the chocolate. Top with a second meringue to make a sandwich. Repeat until all of the meringues are sandwiched together on sticks. Refrigerate the tray briefly to set the chocolate. Don’t leave the pops in the refrigerator, as the humidity might soften them. For the best taste and texture, serve these Meringue Rose Pops on the same day they are made. If you need to store them, they can be kept in a low-humidity environment in an airtight container at room temperature for up to a week. Click Here to View All Lollipop Candy Recipes!